I may have misunderstood my gun store owner, but I think he said that Uberti (owned by Beretta) has changed the traditional two piece grip frame, and make it a one piece grip frame like the Ruger single actions. I was wondering if anyone had purchased an Uberti Bisley lately, and if that is true about the grip frame. I have a Cimarron/Uberti Bisley, that I bought several years ago, and it has the two piece grip frame, like the "model P" single actions do. I was unaware of a design change in the Bisley. Not a big deal (unlike the retractable firing pin), but it did take me by surprise. If true, I wonder what other changes are coming down the trail. But...perhaps I misunderstood him. I am sure some Pard(s) can clarify this. They appear to be one-piece. I just bought this Cimarron/Uberti Bisley. Okay...thanks Pard. It is no big deal to me, I was just taken by surprise at the design change. I do like the Bisley I have. It is fun to shoot, and is definitely something that attracts attention at the range. I must say, it took me a while to warm up to the design, since I have always shot the single action "model P" style revolver. But, again, it took me a while to warm up to the Schofield I have, too. I have a cap and ball repro. of the Rogers and Spencer, that has a different feel. Last, but not least, I also have a Starr (single action, not double action) revolver repro. (cap and ball), that Pietta made a while back, and that was the one that took me the longest to get used to. I like it a lot, but boy-howdy, that was one I struggled with for a while. I guess the only down-side to having a one piece grip frame, is that, it would be more of a challenge, if not impossible, to put on a set of one piece grips. I am not sure how one would do that. Oh well...they did not ask me, when they decided to make that change. I am not sure what I would have told them, if they had asked. Thanks again, Pard. Enjoy your Bisley. Interesting to note the difference in that new one piece Bisley Frame frame vs a standard Bisley grip frame. I see that the new one piece frame has a deep cut where the hammer spring is mounted. Also interesting to see the difference in the shape of the main spring. I see the spring has been bent into a U shape at the bottom so it will sit in the slot for it in the grip frame, The originals were screwed directly to the trigger guard part of the grip frame. It also looks like you get a strain screw with the new design, probably really just to keep the spring in place. There were no strain screws in the originals. P.S. also interesting to note how much further the new trigger is when at rest vs the originals. This also brings up another question. Did Uberti make this design change to expedite the process of creating this revolver, thus making it cheaper to build? I have to believe money was the prime motivator in this (and most things). If it is cheaper to manufacture, then would that factor out into selling it for a lower price? Personally, I doubt it. I have found out that just because a product becomes cheaper to manufacture, doesn't mean that the cost savings is passed on to the customer. Uberti seems to be on a roll to move further, and further, away from the authentic designs (retractable firing pins, and now one-piece grip frames for the Bisley). 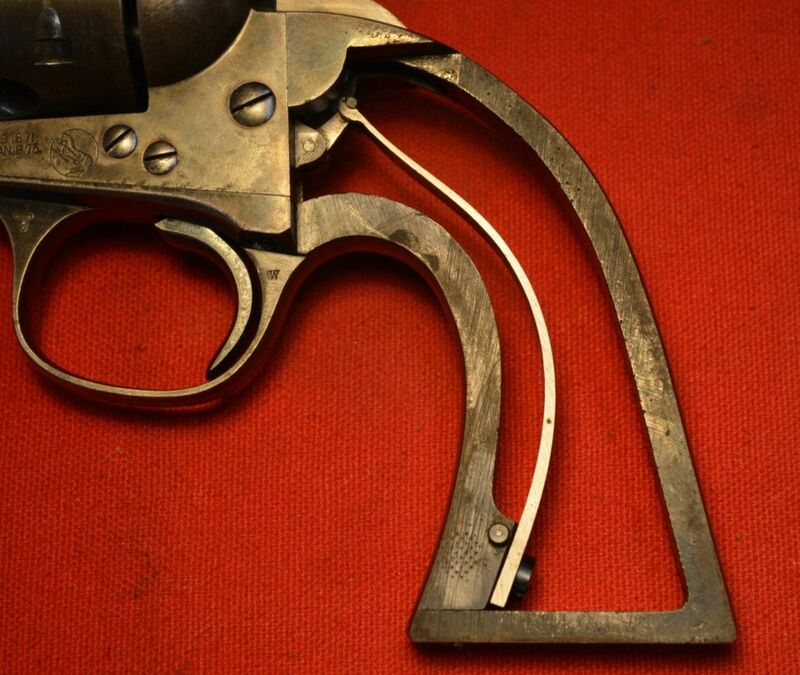 I wonder if any other Uberti revolver designs have gone to the one piece grip frame???? Anyone noticed????? I hope they won't use the lame excuse that changes in design are for the benefit of the consumer, in some way. It isn't, in my humble opinion. It's like saying "I am from the government, and I am here to help you". Yeah...right! Sometimes, it seems, that the firearm manufacturers are like your house cat....your house cat doesn't rub you...they rub themselves...on you. It certainly looks to me like a way to cut cost of manufacturing. That spring is definitely simpler to make than the original style, so there is cost cutting there. The original spring had to be machined to shape. Notice it is tapered slightly from top to bottom. That spring could be stamped out of one thickness of spring steel. One piece means less assembly time, so a little bit of cost to assemble is saved there. I assume there are still three screws bolting the grip frame to the frame from underneath and two screws attaching it from the rear. But one less screw at the bottom holding the two halves together means one less screw, for a couple of cents savings, and one less tapped hole for a couple of more cents savings. The new grip frame is clearly a casting. Of course the original style the two parts were probably castings to begin with that were extensively brought to final shape by machining and polishing. Probably a lot less secondary work to be done with the new design. More cost savings. It even appears to me the locating pin for the gips at the bottom of the grip frame is a cast in detail, rather than a separate pin pressed into place. More cost savings. Now let's not give Uberti a black eye for this design change. ALL manufacturers drive cost out of their products where ever possible. S&W has done it since 1857. Colt did too. Also. having worked in manufacturing for many years myself, it is quite seldom that cost savings in manufacturing a product are actually passed on to the consumer. 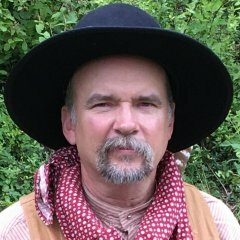 A long time ago somebody in the gun manufacturing business told me that it only costs about $100 for Uberti to manufacture a single action revolver. The cost savings realized by making a one piece grip frame probably only amount to a few dollars over all. Just a wild guess. Anyway, it is not at all unusual for ANY manufacturing company (not just Uberti) to save a few bucks making a product and not pass the savings on to the consumer. Ever heard of MIM parts? By the way, way back in 1915 when S&W stopped manufacturing the 44 Hand Ejector 1st Model (Triple Lock), they did charge about two dollars less for the 2nd Model. Part of this was because they stopped manufacturing the fancy third latch for the cylinder. They charged two dollars less for the 2nd Model than the First, that is historical fact. How much they saved in cost to manufacture is anybody's guess.